← New Album out from TIИKICKER ! 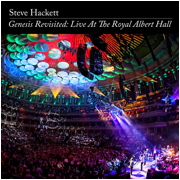 “Prog pioneer Steve Hackett proudly announces the DVD release of his critically acclaimed live spectacularGenesis Revisited, filmed at the sold out show at London’s legendary Royal Albert Hall in October 2013. The DVD of this landmark performance will hit the stores on 30th June 2014. In order to re-live such a seminal chapter of prog rock history live on stage for Genesis Revisited, Hackett surrounded himself with a team of exceptional musicians including keyboardist Roger King (Gary Moore, Snoop Dog, Jamelia), Gary O’Toole (Chrissie Hynde, Kylie Minogue) on drums, percussion and vocals, Rob Townsend (Eddie Henderson, Bill Bruford, Django Bates) on sax, flute and percussion, Lee Pomeroy (Rick Wakeman, Take That) on bass, and Nad Sylvan (Abbas’s Michael B Tretow) on vocals. This entry was posted in News and tagged steve hackett. Bookmark the permalink.